Single family houses have been among Luca Selva’s chief interests in his work from the beginning as means for research on questions of space, typology, design, and architectural phenomenology in general. Specific topics and problems are investigated for the first time with this type of building, and solutions found are picked-up again and developed further in other projects of varied kind and dimension. 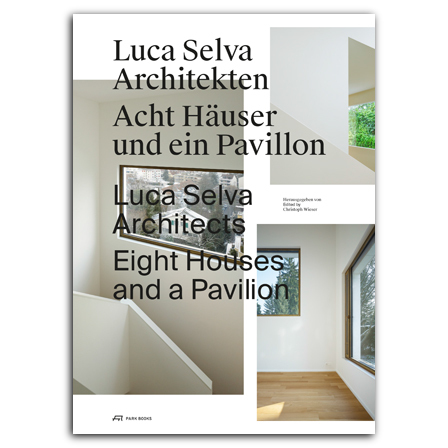 Since 1991 Luca Selva Architects have realized a range of highly interesting projects, including semi-detached double-family homes, a house for an art collector, a house with artist’s studio, or a multi-generation home. The new book presents comprehensively and compares nine of these buildings. They are documented with images, floor and site plans, sections, and elevations. The essays look at the single family home as an architectural task and discuss questions of design in the context of historical and contemporary positions. , born 1962, graduated in architecture from ETH Zurich and established his own studio in Basel in 1991. He is also a professor of architecture at the University of Applied Sciences and Arts Northwestern Switzerland.